Evan Rachel Wood Hosts Anti-Valentines Concert With Sarah Hyland & Other Friends! Evan Rachel Wood is sharing her songs for the broken hearted. 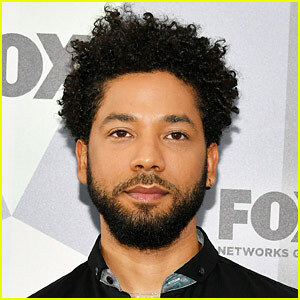 The Westworld actress hosted an Anti-Valentines concert on Thursday night (February 15) at the Hotel Cafe in Hollywood. Attendees included Sarah Hyland, James Marsden and his girlfriend Edei. 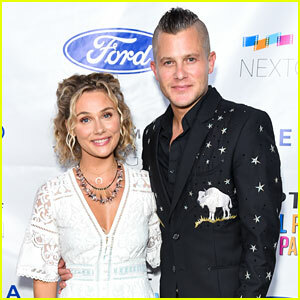 Evan was also joined on stage by her friend Zane Carney as well as Paul McDonald, who performed with his girlfriend Emily Kinney. “What an AWESOME night. 💙💙💙🥀,” Evan wrote on her Instagram after the show. Emily Kinney is a multi-talented star with roles on hit shows like The Walking Dead and the new series Ten Days in the Valley, as well as a music career! 2. Before TV shows and music, I worked on Broadway and in theatre. I also sang backup for different indie Brooklyn bands before I started doing my own music project. 3. I love swimming and try to as much as possible. 4. My favorite band is Frightened Rabbit. 5. My favorite ice cream is mint chip. 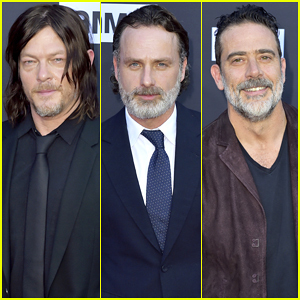 Norman Reedus, Andrew Lincoln and Jeffrey Dean Morgan are dapper as they hit the red carpet at The Walking Dead’s 100th Episode Premiere Celebration held on Sunday (October 22) in Los Angeles. The three guys were joined by their fellow co-stars Melissa McBride, Khary Payton, Josh McDermitt, Steven Ogg, Austin Amelio, Lennie James, Xander Berkeley, Danai Gurira, Alanna Masterson, Emily Kinney, Ross Marquand, Chandler Riggs, Christian Serratos, Lauren Cohan, Kyla Kenedy, Tom Payne, Seth Gilliam, Katelyn Nacon and Brighton Sharbino. Also in attendance at the celebration was Talking Dead host Chris Hardwick and his wife Lydia Hearst, Ashley Tisdale and her husband Christopher French, Yvette Nicole Brown and Lou Diamond Phillips. FYI: Lauren is wearing an Altuzarra dress. Danai is wearing a Mary Katrantzou dress and Sophia Webster heels. Jeffrey is wearing a John Varvatos jacket. Lydia is wearing a Balmain robe. Paris Jackson, Julia Michaels, Sasha Pieterse & More Step Out for People Mag's Ones To Watch Party 2017! FYI: Paris is wearing Andreas Kronthaler for Vivienne Westwood with Sarah Flint shoes. Ivana is wearing HOUSE OF CB. Alisha is wearing an Allen Schwartz jumpsuit, Aldo sandal and Vince Camilo clutch. Lindsay is wearing a PrettyLittleThing x Olivia Culpo Collection dress. Emily Kinney Premieres 'Back on Love' & 'Popsicles' - Exclusive Debut! Emily Kinney sounds amazing in these two new songs – “Back on Love” and “Popsicles” – that we’re debuting exclusively on Just Jared! Both songs will be available for download on iTunes and in 7in vinyl on Friday, October 28. Emily currently stars on ABC’s Conviction, and she’s also had roles on The Walking Dead, The Flash, Arrow, and more!